"This recipe spiced up boring breakfast sausage when I spent summers cooking three daily meals for my father and his crew. Lamb can also be used in place of the pork." In a bowl, mix together with your hands Pork sausage, red pepper, cumin, garlic and salt. Form patties. Fry in a skillet over medium heat until well done. 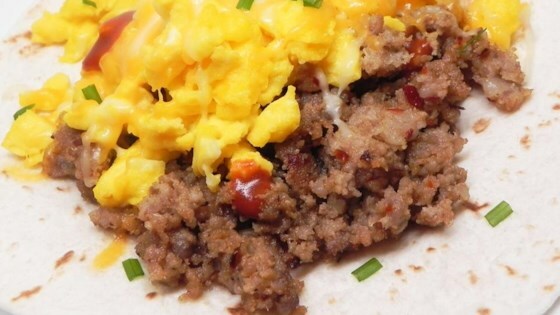 Sausage rises from breakfast staple to elegant entrée. This was awesome. I made some for supper one night. The kids thought it was a little spicy, but the hubby loved it! I'm fixing some for him to take to work and share with the gang! This was a quick easy recipe. The cumin was a little over powering so I will use less next time. I really liked this recipe, but thought it needed something a little more to make it a 5 star so I rating it a 4 star. Very good taste for bland ground pork. I love it!?? I MAKE THIS SAME RECIPE BUT USE BOB EVANS HOT SAUSAGE (IN TUBE). AWSOME WHEN YOU HAVE A LOT OF GUESTS TO FEED.